The Holiday season has arrived, as has the yearly race to decorate everything that doesn't move. Downtown Wilmington was quick to install festive street wreaths the first of November! 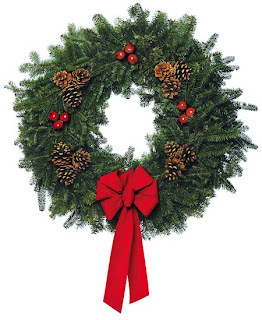 The wreath is a popular and traditional decoration, generally fashioned from evergreens, which appropriately enough, stand for "strength of life". A wreath hung on your home's door is a welcoming touch for visitors, and your style can be as simple or as elaborate as you'd like. 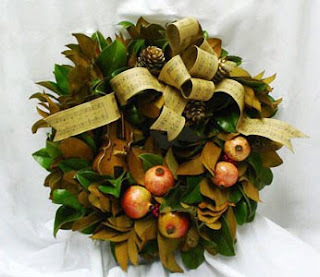 I'm particularly fond of the fragrant balsam wreath, and since moving here from New England a few years ago, have made it a yearly tradition to order one from L.L. Bean in Maine. As soon as it lands on my doorstep and that fresh scent wafts up around me, the holidays have arrived and I am transported back to a time when Christmas meant cold and snow and long drives to be with family. Wreaths made completely of berries are attractive, too. 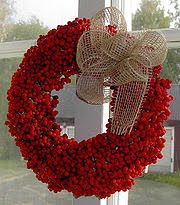 But a caution: if your wreath is made of particularly tasty berries and is accessible to birds, it will be snacked upon! 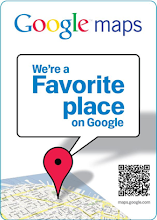 Best to display it in a protected area instead. If you'd like to do something a bit different than a traditional wreath, consider a Kissing Ball. These have become very popular in the last few years as porch decorations, and adding lights makes them even more festive. 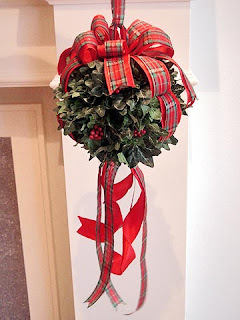 Originally made only of holly, they were hung from the center of a doorway, and tradition called for every person passing underneath to be kissed. Now they can be made from anything: evergreens of all kinds, ivy, berries, even nuts! Magnolia wreaths are traditional in the South. I love how this one has incorporated pomegranates, musical instruments and sheetmusic ribbon to accent the two-tone magnolia leaves. So elegant! Coincidentally, my home state of Maine is also the home of the world's largest wreath maker- the Worcester Wreath Company of Harrington. For years, Merrill Worcester and his crew have made the trek to Washington DC to lay wreaths at Arlington National Cemetery on Wreath Laying Day, December 12. 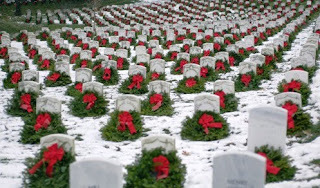 During this holiday season, let's not forget to take a moment and remember the men and women who have given their lives for us all. And when you're out scouting holiday decorations, remember to support the merchants of Historic Downtown Wilmington and the 3/50 Project.